Meat production is responsible for more environmental degradation than any other single industry. Animal agriculture accounts for at least 14.5 percent — and, according to some studies, as much as 51 percent — of greenhouse gas emissions, 80 percent of antibiotic use and 37 percent of pesticide use. Livestock grazing is one of the greatest threats to imperiled species, affecting 14 percent of threatened or endangered animals and 33 percent of threatened or endangered plants. Meat production uses 140 percent the amount of pesticides as plant-based foods. 3.2 million native animals were killed by Wildlife Serives in 2015. Annual chicken production in the United States is responsible for the greenhouse gas equivalent of nearly 1 million cars. Processed meals like hot dogs - increase risk of death by 20%. A plant-based diet can reduce your cartoon footprint by as much as 60%. Producing a pound of tofu requires 1/10 the water needed to produce a pound of meat. Switching to a plant-based diet can save 8 times more emissions than an all-local diet. Vegetarians are 19% less likely to die from heart disease than meat-eaters. Choose organic food and drinks, if possible. Ditch the disposables. Use reusable plates and silverware instead of paper or plastic. Make recycling easy. Have a clearly labeled, easy-to-find receptacle for recyclables. Give food scraps a second life. Compost your wildlife-friendly scraps for the garden. Properly dispose of wrappers, plastic and other remaining trash. 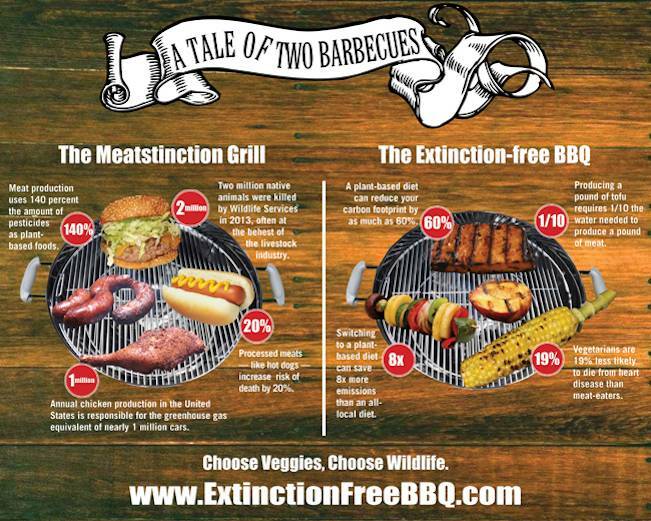 Share your own ideas for an #ExtinctionFreeBBQ with us on Facebook or Twitter @ChooseWild.